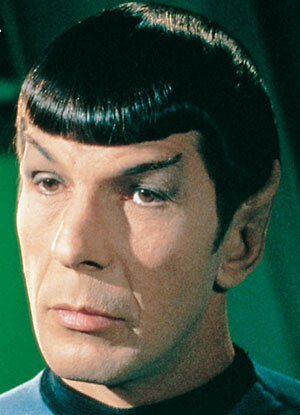 NASA’s Spitzer Space Telescope has detected two asteroid belts around Epsilon Eridani, the planetary system closest to ours and home to Star Trek’s fictitious First Officer Spock, the space agency reported yesterday. A planet near the inner asteroid belt was identified eight years ago. The newly spotted planet is in the vicinity of the outer belt. 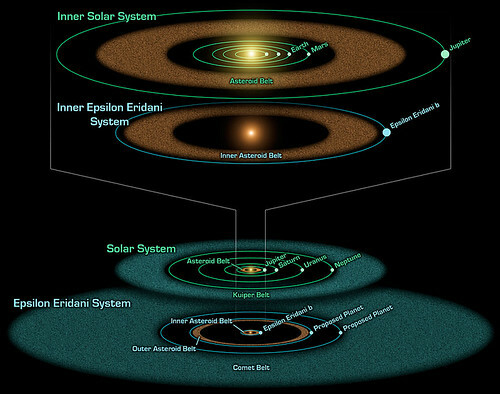 Epsilon Eridani is around 10 light-years, or 62 trillion miles (98 trillion kilometers), away from Earth’s solar system and, at a mere 850 million years old, is considered a younger, similar version of our own 4.5- billion-year-old system. 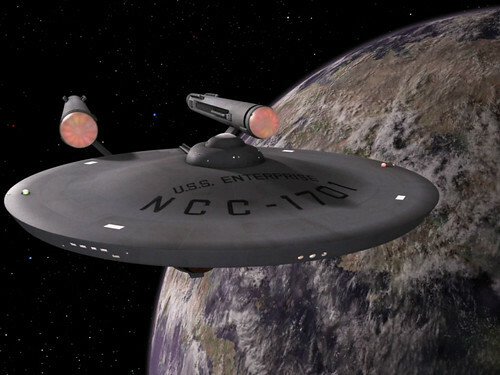 Star Trek creators made it the home of Vulcan, and it’s possible that there are as-yet-unseen Earth-like planets between the star system and its inner ring, astronomer Massimo Marengo of the Harvard–Smithsonian Center for Astrophysics told McClatchy Newspapers. "We certainly haven’t seen it yet, but if its solar system is anything like ours, then there should be planets like ours," Marengo told USA Today. Naturally, this prompted an active discussion on Slashdot, with several citations to literary fiction. More serious discussions abound. Epsilon Eridani and its planetary system show remarkable similarities to our solar system at a comparable age. "Studying Epsilon Eridani is like having a time machine to look at our solar system when it was young," said Smithsonian astronomer Massimo Marengo (Harvard-Smithsonian Center for Astrophysics). Marengo is a co-author of the discovery paper, which will appear in the Jan. 10 issue of The Astrophysical Journal. Lead author Dana Backman (SETI Institute) agreed, saying, "This system probably looks a lot like ours did when life first took root on Earth." Our solar system has a rocky asteroid belt between Mars and Jupiter, about 3 astronomical units from the Sun. (An astronomical unit equals the average Earth-Sun distance of 93 million miles.) In total, it contains about 1/20 the mass of Earth’s Moon. Using NASA’s Spitzer Space Telescope, the team of astronomers found an identical asteroid belt orbiting Epsilon Eridani at a similar distance of 3 astronomical units. They also discovered a second asteroid belt 20 astronomical units from Epsilon Eridani (about where Uranus is located in our solar system). The second asteroid belt contains about as much mass as Earth’s Moon. A third, icy ring of material seen previously extends about 35 to 100 astronomical units from Epsilon Eridani. A similar icy reservoir in our solar system is called the Kuiper Belt. However, Epsilon Eridani’s outer ring holds about 100 times more material than ours. When the Sun was 850 million years old, theorists calculate that our Kuiper Belt looked about the same as that of Epsilon Eridani. Since then, much of the Kuiper Belt material was swept away, some hurled out of the solar system and some sent plunging into the inner planets in an event called the Late Heavy Bombardment. (The Moon shows evidence of the Late Heavy Bombardment – giant craters that formed the lunar seas of lava called mare.) It is possible that Epsilon Eridani will undergo a similar dramatic clearing in the future. Some of us would like to believe another planet like ours exists, which recalls the power of the Vulcan Mind Meld in convincing people to think otherwise. This entry was posted on Wednesday, October 29th, 2008 at 6:44 am	and is filed under Cool Stuff, Navigation/GPS. You can follow any responses to this entry through the RSS 2.0 feed. You can leave a response, or trackback from your own site. Just so you know, Epsilon Eridani is no longer identified as Vulcan’s sun. According to a letter from Gene Roddenberry and three scientists from the Harvard-Smithsonian Center for Astrophysics, 40 Eridani a is now considered a much better candidate. This information can be found in Sky and Telescope (July 1991) or this webpage: http://www.projectrho.com/vulsun.htm. Just trying to keep you up to date, don’t mean to step on any toes.